I’ve never been very good with schedules and plans. There are a dozen reasons for it and I think most of them boil down to being a bit impulsive, meaning it’s a one-size-fits-all explanation that actually fits. So the plan for today was to finish up with the Favorite Finds but I pretty much did that last week. Since I didn’t really have a “plan B”, why don’t we have some fun with the new catalog – the Summer 2015 Moda Piece – Issue No. 14. This catalog was finished just a few weeks ago and the Pre-Market catalog is nearing it’s deadline. As soon as it’s done, the Market catalog looms. Which means quilt designs and pattern notes and sewing and… I’m getting ahead of myself. Let’s get back to the Summer catalog. It’s a bigger, better, easier-to-use swatch-deck, swatch-card, color palette for Bella Solids. The one pictured is our mock-up, the real one will have all 2,083 colors of Bella Solid. (There aren’t really that many but I couldn’t exactly use my color card to count.) The best part is that it will come apart so that the swatches are loose. But because they’re numbered, it will be easy to put it all back together. I think I’m going to need two. One to have sitting pretty on the shelf and one to take apart and actually use. There are lots of beautiful new collections included in the catalog, these are showing to shops now and will be available late this Fall. First Crush by Sweetwater. 30s Playtime 2015 by Chloe’s Closet. Old Cambridge Pike by Barbara Brackman. Basic Mixologie by Studio M. Dogwood Trail II by Sentimental Studios. Hyde Park by Blackbird Designs. Petite Prints Deux by French General. That’s better. And don’t you love the new twill tape for the pre-cuts? It’s been in the works for quite some time but it’s taken this long for it to actually start showing up on the pre-cuts. Timing. It’s been one of the oddest things to get used to here, everything we’re working on today won’t be shown for several months. And it won’t be in shops for several months after that. For example, back in January, I took pictures of the artwork sent in by Sandy Gervais. That artwork became Sweetness, a collection debuting in this catalog, a collection that won’t be in stores until November. 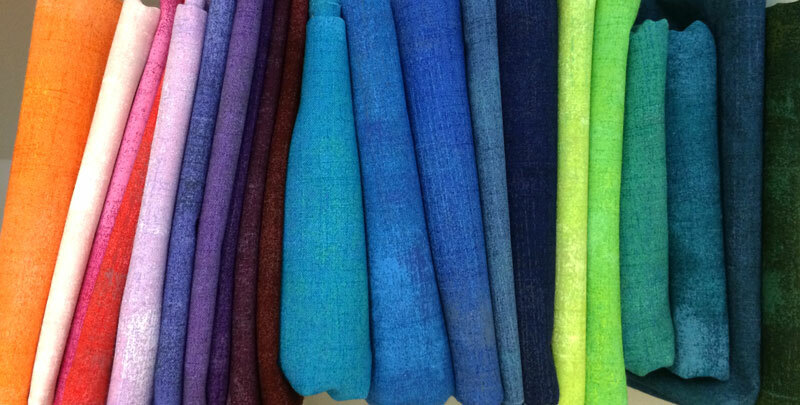 (And when it’s ready to ship, we’ll share the process of how that artwork became fabric. I’d show you the fabric for that but we haven’t received the pre-cuts yet. Some arrive early, others arrive… when they arrive. Try planning and scheduling around that – especially when samples are required. 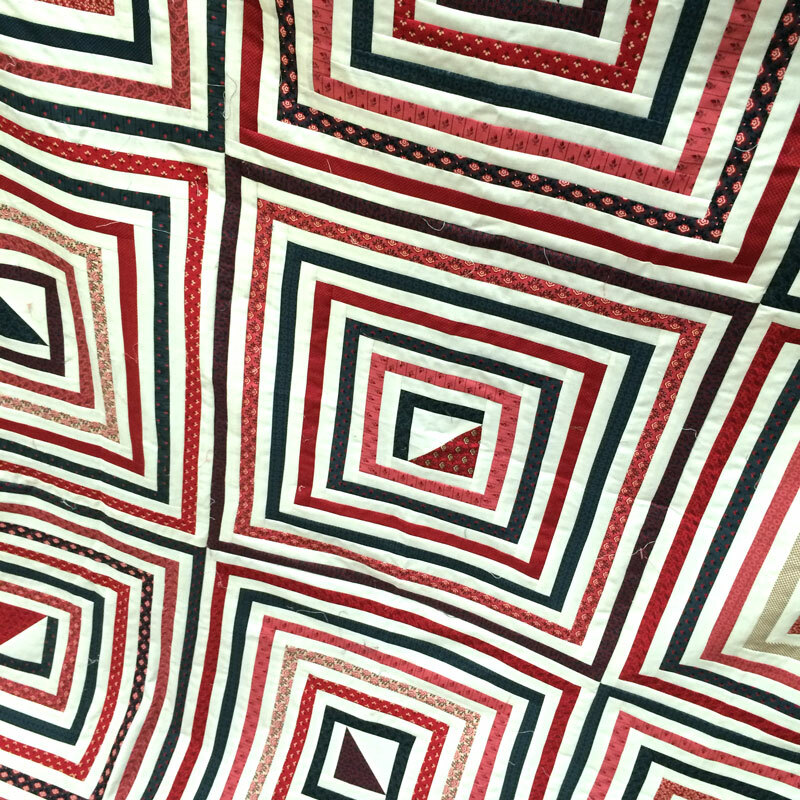 We’ve had the Petite Prints Deux just long enough for Tammy to make this Petite Bateau quilt top for French General. And for my buddy Judy to make this Catch-All Caddy with Basic Mixologie. Ever After by Deb Strain ~ a wonderful Valentine-Wedding-True Love kind of collection with hearts, text prints and panels in white, pink, red, gray and black. 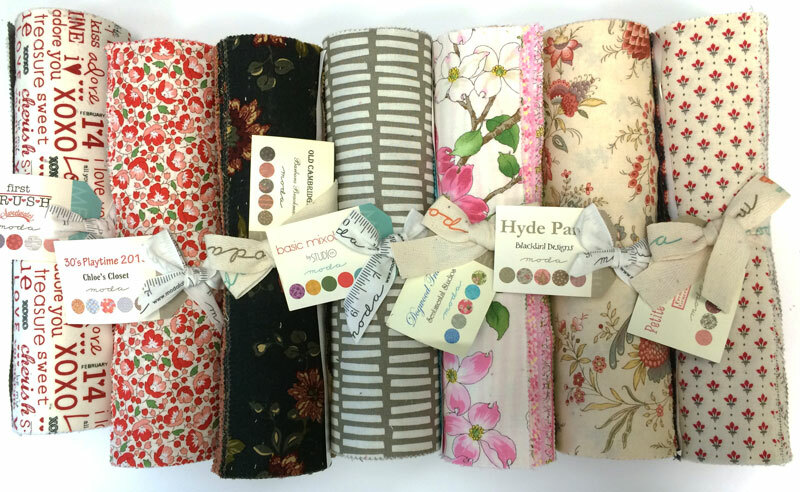 Cozy Cottage Flannels by Kansas Troubles ~ the wonderful colors and prints you know from Lynne, this time done in a soft, yummy flannel fabric. I don’t know what we’re doing with this but I think we need to do something… these are the new colors of Grunge by Basic Grey. Did you know that these prints can also be used as a solid? I didn’t – not until Susan mentioned that she knows several ladies who do that. I think this stack just might have to follow me home so I can do a little experimenting. And you wonder why I have problems following a plan? Or staying on a schedule? Distractions. They’re related to that whole “impulsive” thing. How do I get the match maker? WHAT is the new twill tape that you spoke of for pre-cuts????? 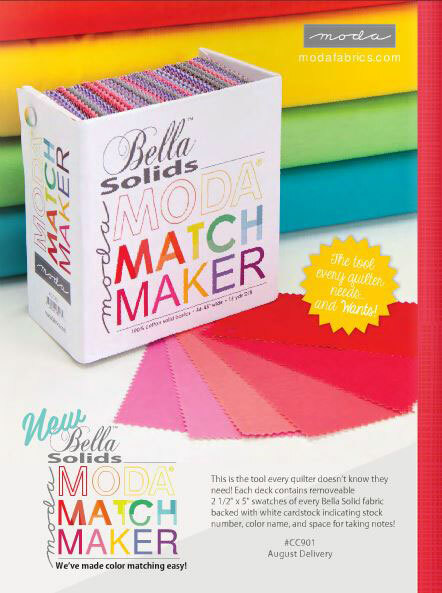 and where does one get a moda match maker of solids???? I can’t wait to try Match Maker. Another great posting. Thank you Carrie. I absolutely love grunge and the new colors are fabulous!!!! And that Match Maker, Awesome!!!! Thanks for the peeks at all these new lines, I’d better get sewing! Be still my heart!! Love it all!! And that Grunge…LOVE!! 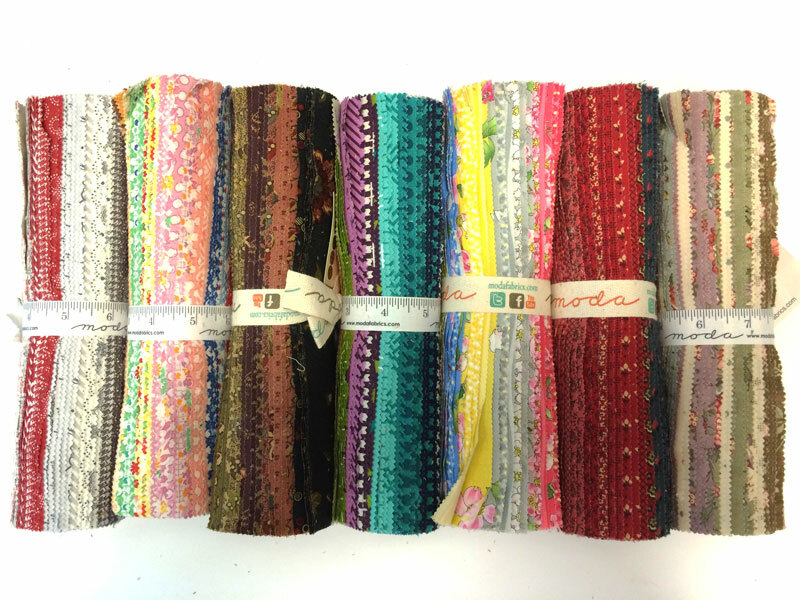 I buy Bella Solids all the time and have been cutting samples of each before using them in projects. 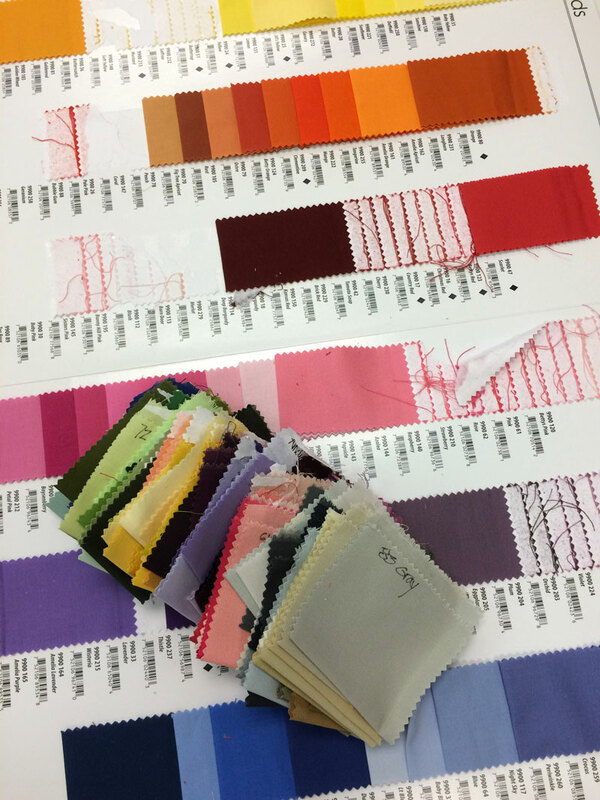 Recently I needed fabric for sashing so I got out all my samples and decided on which color to order. This color matcher would be sooo much more convenient. Hope they will be available to the public. Love the Twill Tape that ties the bundles together. Hi Sandra – The Moda Matchmakers will be available to everyone! If your local quilt shop isn’t getting them, see if they’ll order it for you. If that doesn’t work, I’m sure an online shop or two will also have them. Love your post, thanks for sharing! I agree with Mary Ann. I must get lots of sewing done to make room for some of these new yummies. I’m smitten! 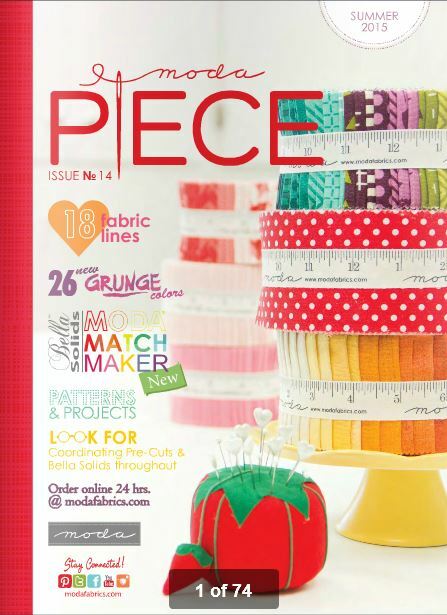 I am swooning for First Crush and I will purchase some precuts for the twill tape alone. And the color matcher-be still my heart!! 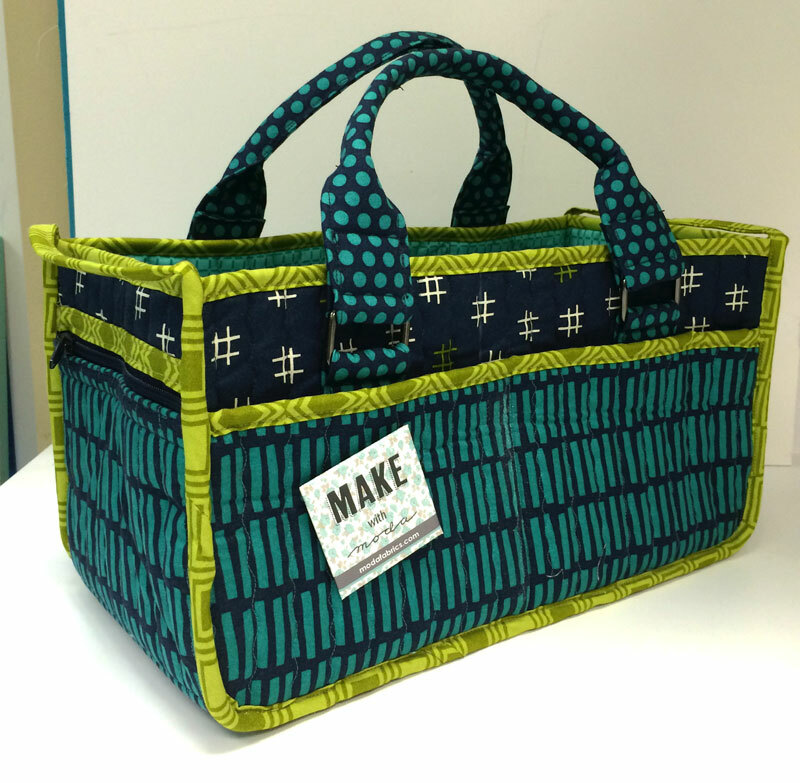 I have had to increase my quilty budget since you started showing me all the stuff I NEED! beautiful! it feels to good to read your blog again after my world has been turned upside down. And here I thought that Grunge was the “solid” in the early collections by BG. Never occurred to me to use it as a print. I learn something new from you every column. I purchased some 108″ wide bella solids in bleached white for a project. Alas I need just a little more. Does anyone know if the 42″ bella bleached white is the same in density and weave as the backing? I really don’t need another 108″ yard.